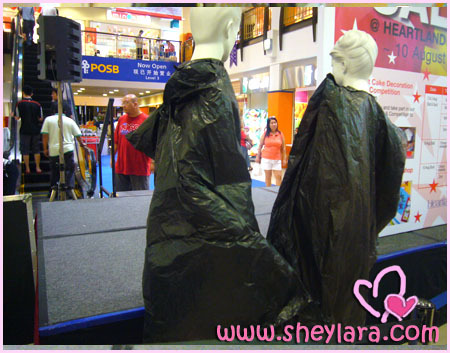 Presenting the latest in haute couture, hot off the glitzy runway of Heartland Mall! Spectators were completely bowled over by the creativity and free-spiritedness reflected in this shocking and innovative new design by a relatively unknown young designer, who looks set to elevate the status of Singapore haute couture. The designer was unfortunately unavailable for comment. But Sheylara.com followed the models backstage for a quick interview. I see you were amusing yourself in Heartland Mall while waiting for us? I spy Goonfather in the background! Looks like I kena tipu by u. you really talk to those mannquins? It’s excellent, easy to find, waterproof and cheap too. Where got cooling? No ventilation wor! yeah loh, plastik people are always cooling. They can actually move around at night in ghost month. I guess one size fit them all :D hahahaha. Relax: Haha. Nice. Thanks for the compliments in your blog! :) Um.. what’s “tipu”? Jesta: What did Dilbert do? 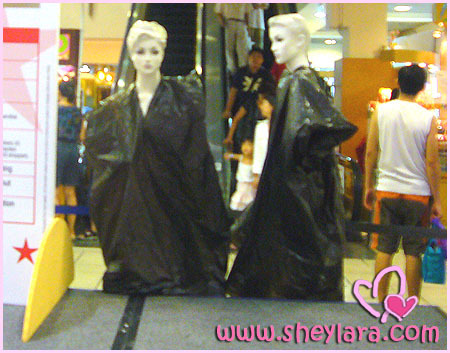 Wear garbage bags to work? kaoz … u r reduced to talking to dummies now?? dxtehsecks: Haha. Would you dare to wear it out? Ruok: Yah lah… you so long never jio me out. pinky: I dunno. I thought it looked like it was quite deliberately done, the way the bags were draped around the body and cut to resemble real clothes. Heheh.